Advantages: Interesting narrative, varied collection of rare period photographs, detailed 1:72 and 1:48 scale drawings, superb colour artwork. Conclusion: A “one stop” publication that caters for the modeller and enthusiast alike. The exploits of the Gotha G.III– G.V series continues to fascinate enthusiasts. These strategic bombers operated over Britain first by day and then by night, instilling fear into the local populace. These aircraft, along with the G.I, have been covered before in the Datafile series, but what about those designs that followed these giants of the air. This publication aims to fill that gap by describing such types as the Gotha GL.VII, G.VII, G.VIII and G.IX. They didn’t look very much like their predecessors (due to their changed roles) and their contribution to the war effort was minimal. Nonetheless their story must be told to get a complete picture of the lineage of these famous (or infamous) aircraft. There are 32 pages between the soft card covers. The informative and concise text is supported by an interesting selection of over 75 black and white photographs. As can be expected with a subject such as this, the period images are quite rare and it comes as a welcome surprise that so many offer a very high level of clarity and detail. To take advantage of this, a number of them are printed as whole or half page reproductions to give maximum benefit to the viewer. The colour artwork is always a feature of these publications. This issue is no exception as we are treated to 3 aircraft profiles from the desk of Ronny Bar. A variety of schemes is covered and represents a couple of Gotha GL.VIIs and a single G.IX. 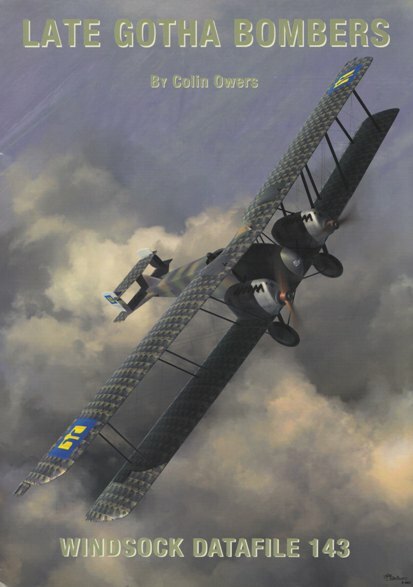 A further example of the former can be seen on the cover where Jerry Boucher contributes a dramatic portrayal of the Ukrainian GL.VII “Olena”. There are 8 pages devoted to the detailed plans feature which have been drawn and traced by Martin Digmayer. Specifically they cover the Gotha GL.VII and are produced in the popular scales of 1:72 and 1:48. Rounding out this volume is the appendices which list the manufacturer, serial allocation and production figures of the various types of bomber. Also included is a table consisting of known dimensions for both the GL.VII and GL.VIII and these come from various sources. All this culminates in a publication that allows the reader to gain a better understanding of this company’s most legendary series of aircraft.